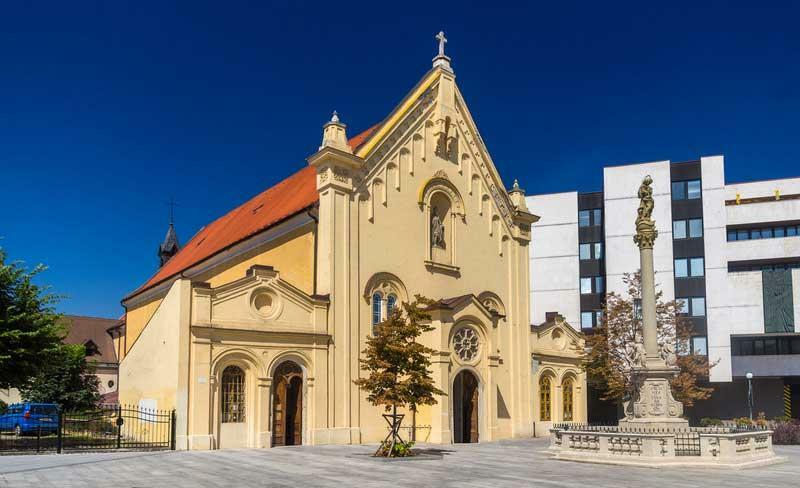 The Capuchin Church & Monastery is a great place to start a walking tour of the Old Town when you visit Bratislava. You can reach this starting point by cab, on local transit or with an organized tour. From the Capuchin Church and Monastery, enter the Old Town by walking down St Michael’s Street through St Michael’s Gate. St Michael’s Gate is the last of four original city gates through the Old City walls. Stroll the shops and restaurants of St Michael’s Street. 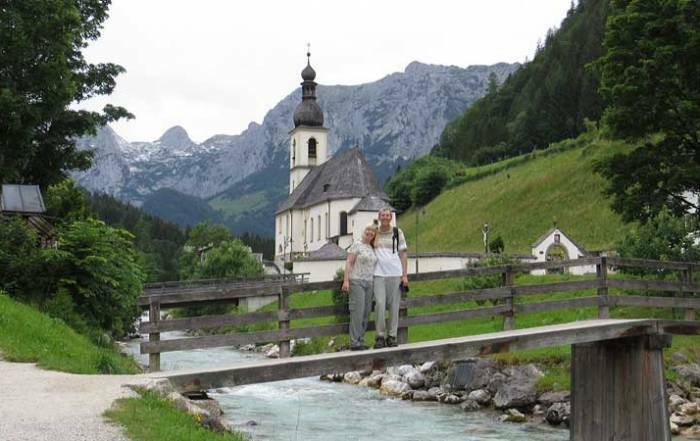 Nearby are the Franciscan Church & Monastery dedicated in 1297 and Mirbach Palace, which is a 1770s Rococo-style palace. 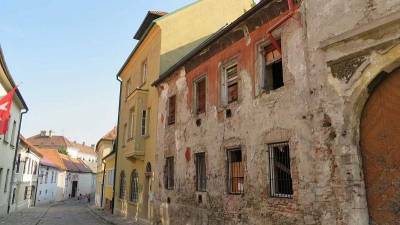 From there, continue your Bratislava Old Town Walking Tour to the Main Square. 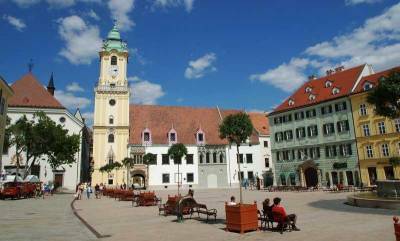 The Main Square is a central focal point for locals and tourists who visit Bratislava. 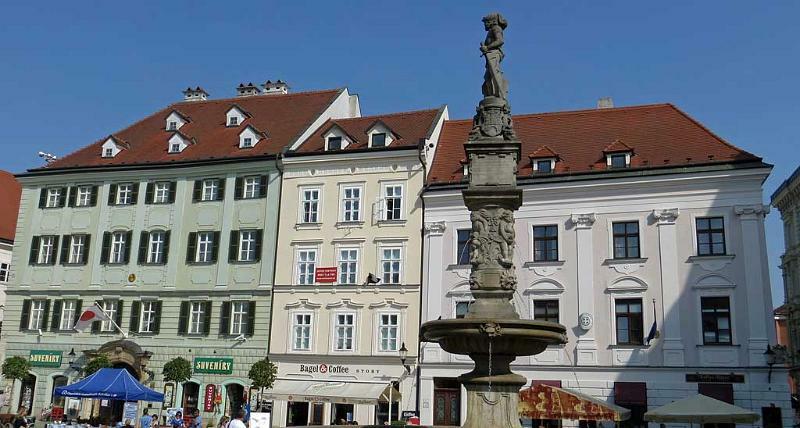 In the Main Square you will find the Roland Fountain, the Bratislava City Museum and the Old Town Hall. The Old Town Hall still sports the imprint of a canon ball that was fired by Napoleon’s troops. Less than a block away from the Main Square is the Primate’s Palace facing Primate’s Square. 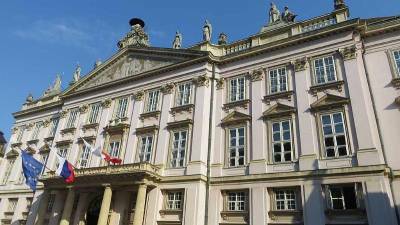 The Primates Palace is a highlight of Bratislava with its marble statues and a white facade capped by a cast iron cardinal’s hat turret. The Hall of Mirrors inside the Primate’s Palace is a smaller version of Palace of Versailles’ Hall of Mirrors. Napoleon signed the Pressburg Treaty here in 1805 after his defeat at the Battle of Austerlitz. St Martin’s Cathedral is a must see in Old Town Bratislava. The cathedral is only a 10 minute walk from the Main Square, but it’s a stop that many organized tours don’t visit. St Martin’s Cathedral is where 19 Austro-Hungarian emperors were coronated, including the famous and well-loved Maria Theresa of Austria. The interior of St Martin’s Cathedral is simply beautiful in its design and stained glass. The fee to enter the church is nominal. 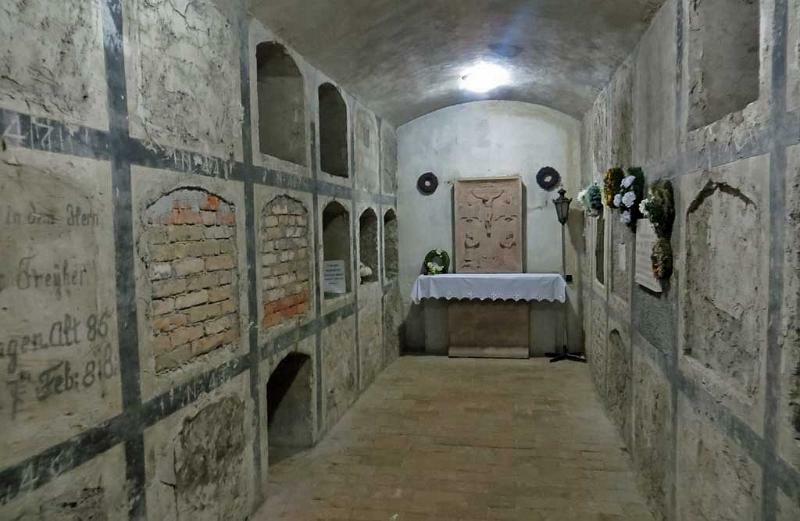 You can also see displays of coronation crowns, climb the stairs to the chambers near the church organ and descend a narrow stairway to the crypts under the church. Don’t miss a visit to St Martin’s Cathedral on your Old Town walking tour. 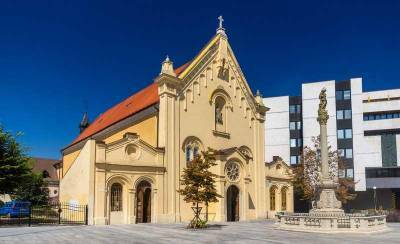 From St Martin’s Cathedral, continue your Bratislava Old Town Walking Tour by strolling through the greenery of Hviezdoslav Square to the striking architecture of the Slovak National Theater. 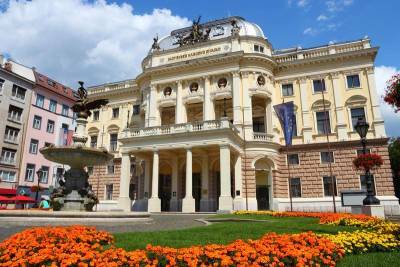 From there you can finish your walking tour by passing the Slovak Philharmonic to the Slovak National Gallery and the Slovak National Museum on the Danube River. The major river cruise lines dock on the Danube here. 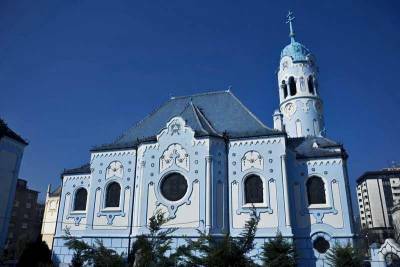 Another less frequently visited attraction in Bratislava is the Blue Church of St Elizabeth. This church is only a 10 minute walk east of the Old Town Main Square. The blue exterior of this little church is very distinctive. 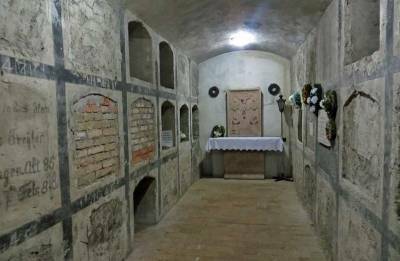 The Blue Church of St Elizabeth has iron gates that allow visitors to peer into the interior when the church isn’t open. The Little Blue Church is well worth a side trip from Old Town Bratislava, but use your GPS to find your way. Bryndzové halušky – soft potato dumplings with bryndza (soft sheep cheese) and bacon. Richman – bread roll filled with cabbage and cheese. Treska – cold codfish salad. Bratislava Castle is on the hill overlooking the city, next to the Old Town. Take a cab or an organized tour to reach the top of the hill. 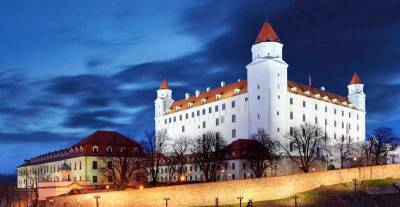 Bratislava Castle is a 1900s reconstruction of the original 9th century castle that was destroyed by fire. 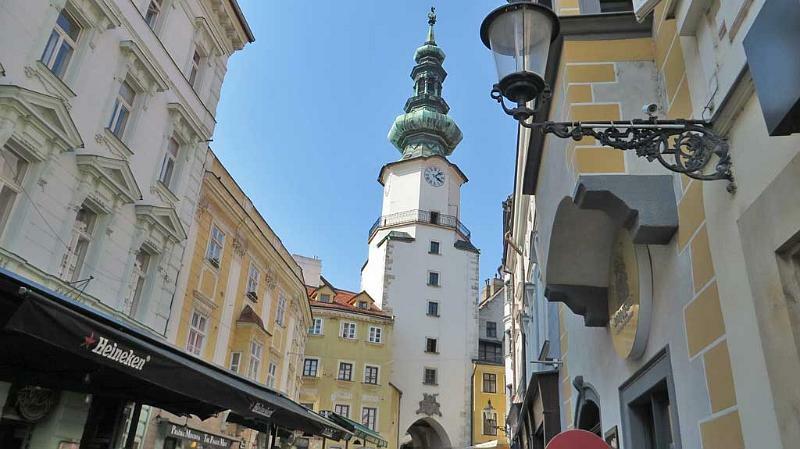 On the way up to Bratislava Castle, visit the House of the Good Shepherd which is home to the Museum of Clocks. The gothic St Martin’s Cathedral is on the route up too. 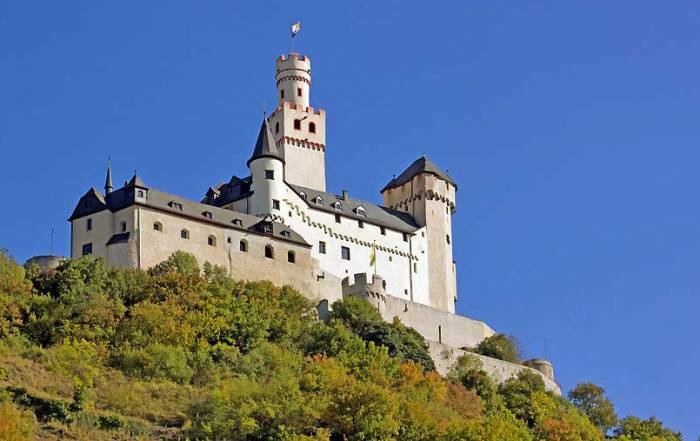 If your Bratislava Castle Tour doesn’t stop at these two attractions then catch them on a walking tour of the Old Town. Bratislava Castle exterior makes for great photos, but some will be disappointed that there isn’t much to the actual site. the Jewish Community Museum, Chatam Sofer mausoleum and the Jewish Quarter. Grassalkovich Palace – the Slovak Presidential Palace located at Hodzovo Square. The Slovak National Theater and the Eurovea shopping complex. Slavín War Memorial – built in 1960 in memory of the 6,000 Soviet soldiers that died fighting the Nazis in West Slovakia. Take the elevator to the Observation Deck and UFO Restaurant of the Bridge of the Slovak National Uprising. 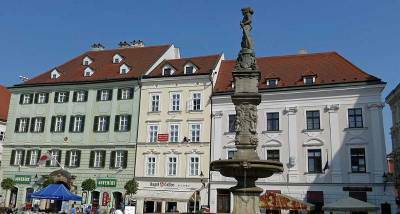 Bratislava’s Zoological Park and its Botanical Garden are both only a few minutes west of the Old Town. 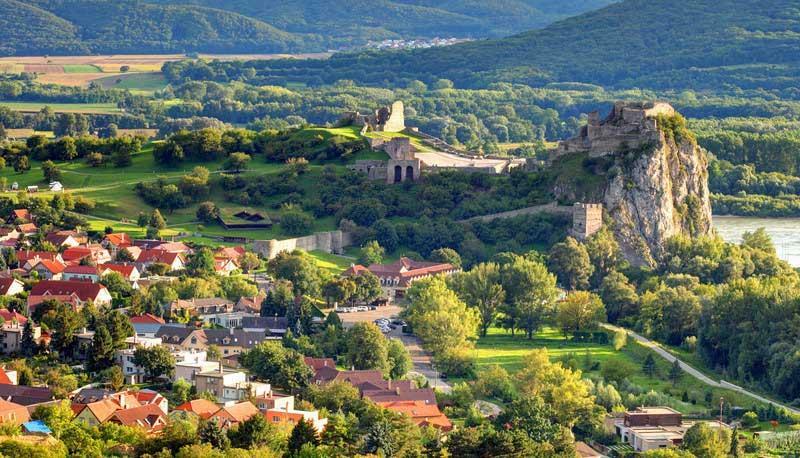 Devin Castle is about 20 minutes from the Old Town, where the Danube and Morava Rivers meet. See ruins from the Romans and the Greater Moravian Empire. Napoleon’s troops destroyed Devin Castle in 1809. Rusovce Manor is a castle about 20 minutes from Bratislava. 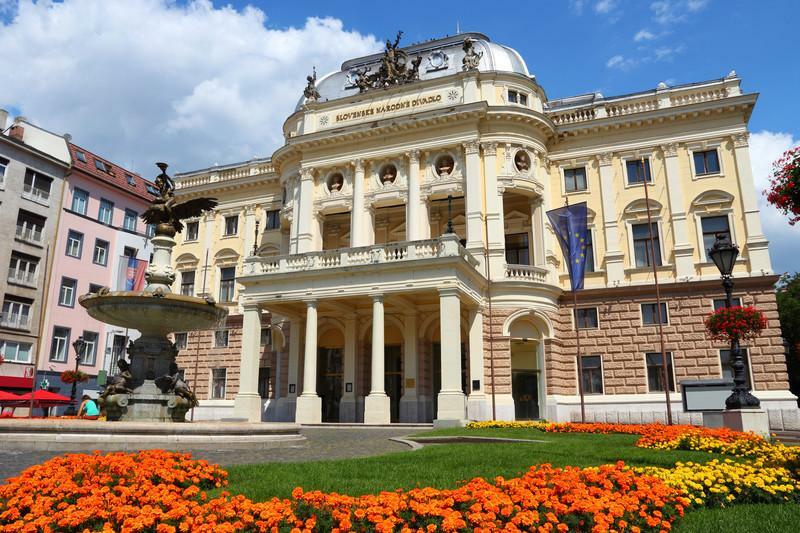 Travel one hour by train to Vienna or cruise there on the Danube. Most people get to Bratislava by rail or on a Danube River Cruise. Bratislava is about an hour by rail or bus from Vienna. 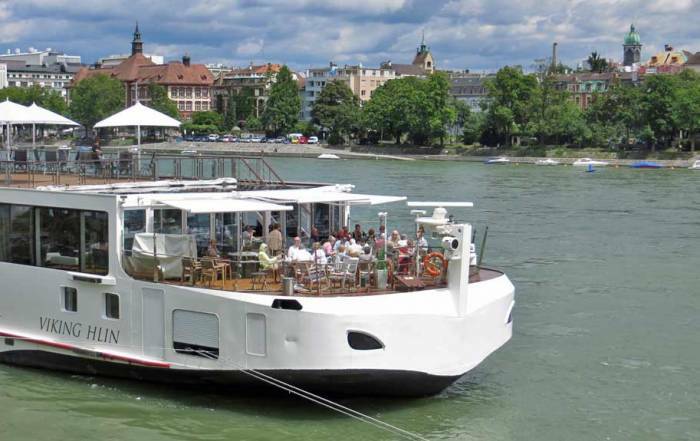 Major river cruises companies regularly stop in Bratislava as part of the Danube River route through Vienna and Budapest. 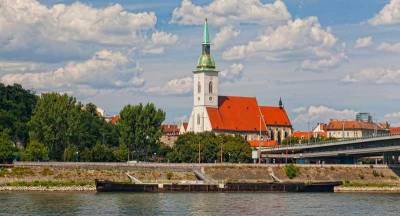 You can’t start a Danube River Cruise in Bratislava with major river cruise lines, but you can get to Bratislava on a day trip catamaran cruise from Vienna. Most visitors don’t get to Bratislava through the Bratislava Airport, because the connections are so much better and convenient through Vienna. Dopravný podnik Bratislava, a city-owned company, operates public buses, trolleys and trams. 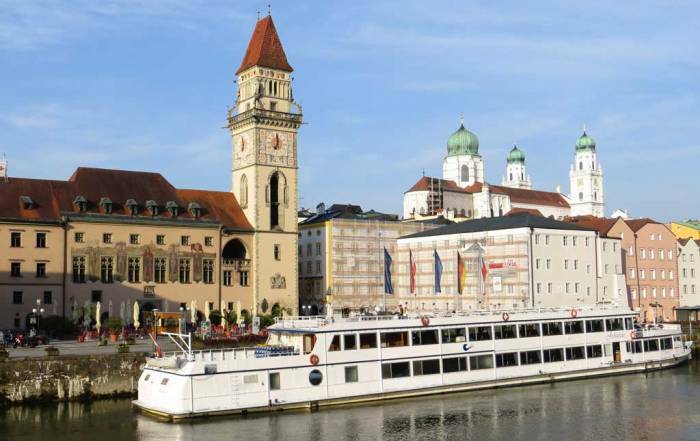 Cruise ship passengers won’t likely need to use local transit because Danube River cruises dock right in the Old Town. Bratislava weather is a continental climate. The height of summer is the months of July and August with average highs around 27 C (80 F) and average lows of about 15 C (59 F). From December to February expect average highs around the freezing mark and average lows of -2 C (28 F). Rainfall is slightly higher in the summer months from May to September. June and September are good options for a visit as temperatures are still comfortable and you can miss the peak of the European tourist season. The summer months are the most popular time of year to visit Bratislava. 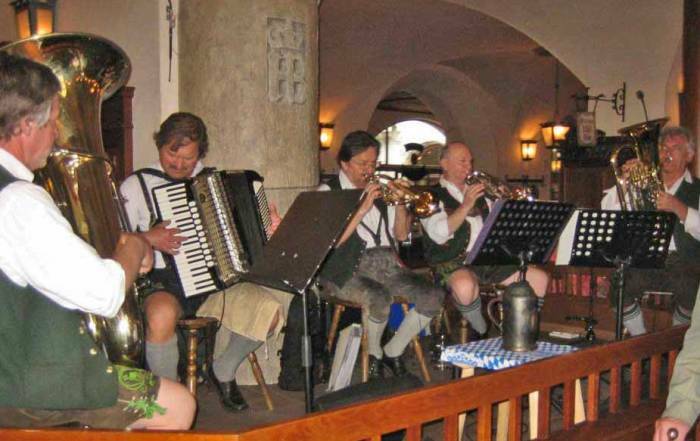 Bratislava is located on the Danube and Morava Rivers at the foot of the Little Carpathian Mountains. The city was previously known as Prešporok and the Germans called it Pressburg. About a half million people live there. Bratislava is the capital of Slovakia and has a long history of Austrian, German and Hungarian influences. When Slovakia was part of Czechoslovakia, it came under the control of communist Russia. The influence of Russian communism is still seen today in the bland architecture of tenement apartments and public buildings.